Welcome to AFSA! Founded in 1924, the American Foreign Service Association is the professional association and labor union for America's diplomats as they serve their country all over the world. Click here to join AFSA! AFSA offers many benefits to its members (note that benefits differ by membership category). Among these are individual labor-management counseling, individual retiree counseling, a subscription to The Foreign Service Journal, scholarships and merit awards for children of members, a daily media digest, grievance representation and legal services, awards and other honors, various discounts (including Zipcar and a number of magazines and periodicals), an online memorial tribute site honoring deceased colleagues, numerous events in Washington and elsewhere, and updates on key issues that impact FS employees, federal and retiree benefits. Click here to read more about the benefits of AFSA membership. We encourage you to log in to our secure website for most member services – renewing a membership, joining AFSA, making a donation, changing your address, updating your information, etc. To log in to the online section of the AFSA website, visit ams.afsa.org/eweb or click on the login icon in the upper right hand corner of the AFSA website. Simply click on the pencil icon on the “My Profile” page to edit your information. 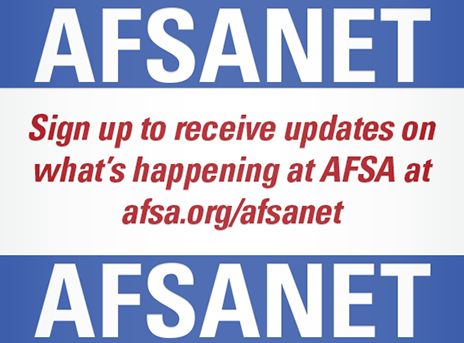 IMPORTANT: AFSA members do not need to create a new account or register, only log in on the right side of the webpage. All members have existing accounts and can log in immediately. To log in for the first time, use your primary email address as your username. Use your last name in all lowercase letters as your password. You will be directed to update your password after you log in. We hope you enjoy this new member benefit. If you have any questions or would prefer to opt out please email us at member@afsa.org. If you are an active-duty or retired member of AFSA, you have elected representatives on our Governing Board who are charged with ensuring that your interests are served as AFSA pursues its priority issues. Our President, Secretary and Treasurer are elected by the entire membership and represent all members. In addition, each constituency (State, USAID, FCS, FAS, BBG, APHIS and retirees) has designated representatives on the board. We encourage all members to stay in close touch with their representatives to make sure your voice is heard. Click here to get to know more about the AFSA Governing Board and your individual representatives. In addition, AFSA’s Post Representative program seeks to ensure that an individual representative is available at each and every post around the world to assist members and act as a conduit back to AFSA in Washington, D.C. Needless to say, there is significant turnover in these positions as members move from post to post, so consider stepping forward to serve as an AFSA Post Rep to help us better understand the issues effecting you and your colleagues. Click here to read more about the Post Representative program, to identify the Rep at your post, or to become one yourself. In 1973, AFSA was certified as a labor union. As the exclusive representative for the Foreign Service employees in the five foreign affairs agencies, AFSA has certain rights and responsibilities under the Foreign Service Act and the individual "framework" or collective bargaining agreements AFSA has negotiated with the various agencies. AFSA's rights and responsibilities can be broken down into two broad categories: negotiating/consulting with the agencies regarding changes in "conditions of employment" and representing individual employees in grievances and certain meetings with management. Click here to read more about AFSA’s labor-management role and responsibilities, and to get in touch with our labor lawyers and counselors. As you transition into retirement, AFSA remains a vital partner. Retaining your membership means you will continue to receive the award-winning Foreign Service Journal, keep abreast of the most relevant articles pertaining to the Foreign Service in AFSA’s Daily Media Digest, receive updates from AFSA leadership on AFSA’s latest engagements with Capitol Hill, and receive the annual Retiree Directory to help you stay connected with former colleagues and friends. In addition, you will have access to expert presenters on various Federal benefits and “Next Stage” (ie, post-retirement) opportunities and activities, AFSA events, and a way to share your expertise and highlight the importance of diplomacy in your local community through AFSA’s Speakers Bureau. Finally, you will be supporting AFSA as the principal advocate for the long-term institutional well-being of the professional career Foreign Service. AFSA is the exclusive representative of the bargaining unit, which encompasses all Foreign Service employees of State, USAID, FCS, FAS, APHIS and BBG, as defined by the 1980 Foreign Service Act. The Foreign Service is unique in that employees move in and out of the bargaining unit based on the position in which they are serving. AFSA membership is available to all Foreign Service members regardless of whether or not it is a part of the bargaining unit. The following positions are outside of the bargaining unit: employees currently serving in positions designated as "management officials" or "confidential employees are excluded from the bargaining unit, as are employees engaged in personnel work (in other than a purely clerical capacity) and those assigned to carry out functions of the Office of the Inspector General. In practical terms, this means that those excluded are Foreign Service members serving as chief of mission, deputy chief of mission, management counselors or management officers, human resources officers, Regional Security Officers and Office Management Specialists who work in the front office or for a management counselor. However, there may be exceptions to these guidelines, so members should contact AFSA headquarters if questions arise as to whether a specific employee is in the bargaining unit. Please bear in mind that non-bargaining unit employees can still be regular AFSA members. Click here to join AFSA! Click here for step-by-step instructions on how to renew your AFSA membership online.